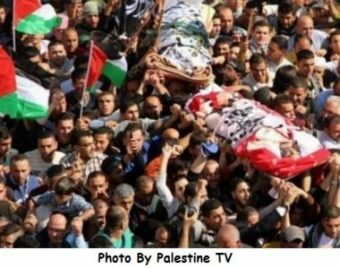 Israeli Public Security Minister Gilad Erdan alleged that the family of Ala Abu Jamal, that buried its son, Tuesday, after Israeli held his body for seven months after he was killed by the army “violated the terms of his burial.” The minister ordered a halt on the transfer of the remaining bodies of slain Palestinians to their families in Jerusalem. Mohammad Mahmoud, the lawyer of the Ad-Dameer Prisoners’ Support and Human Rights Association, rejected Erdan’s allegations, and said that there are many parties in Israel that are trying to stop the transfer of slain Palestinians to their families, as a punishment to them. Mahmoud added that the Abu Jamal family fully abided by the imposed Israeli preconditions; the process started with two family members identifying his corpse in the Oz Police station at the main entrance of Jabal al-Mokabber town, then during the official transfer at the town’s graveyard gate, his burial ceremony and the 40.000 bail that they had to pay. He also said that 50 family members participated in the funeral, and that the other Palestinians were gathered around the area, participated in the prayers in the local mosque, and never entered or approached the graveyard.